Cafes which are part of hotels rarely end up on lists of most ”hip” and ”cool” cafes in town. There is a bit of a prejudice among backpackers against going for coffee in a hotel. But there is one place in Zagreb which will break this kind of prejudices in case you have them. 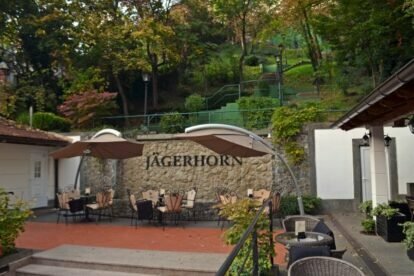 Hotel Jägerhorn is the oldest hotel in Zagreb still in existence and it’s located in the very heart of Zagreb, in the passage “Lovački rog”, near the main square. It was founded in 1827 and many famous persons from Croatian history used to hang around here, like Count Josip Jelačić. Hidden in this passage connecting Ilica and Upper town, it is a cosy and relaxing place with an intimate atmosphere. On this beautiful terrace you can drink the most delicious coffee (a blend from the local Cogito Coffee Roasters) or excellent tea from the neighbouring House of Green Tea shop (Kuća zelenog čaja), while enjoying a wonderful view over the Upper town and surrounding greenery, as well as the gurgling sound of a cascade and singing of birds which come to drink water from the pool (the terrace ends with a small decorative pool with a cascade). The interior of the hotel, including its 18 rooms, is also elegantly decorated, but the highlight of this place is definitely this idyllic terrace.